Exhibition of woven tapestries by Frances Crowe during the Boyle Arts Festival, is open daily from 12 miday to 5pm in the Abbey Community College Boyle County Roscommon. The show consists of two large wall hangings, and 14 smaller framed pieces. The title for this body of work “Threading Water” explores the power and beauty of the sea. It came about when Scottish tapestry artist Joan Baxter invited me to become involved in a touring exhibition titled “Sea Journeys” 2 years ago. This led me to looking at, swimming in and photographing the sea. Reflections, and how light plays on the surface of water. I use a cotton warp, wound around a wooden frame. I always work upright, and make the necessary changes as I weave. The weft is a mixture of wool, and silk. The starting point for my pieces is often a thought, or a sketch, which will play around in my mind for a few days or weeks. I develop this into a colour study , and even a painting . Before work commences on the tapestry. By its very nature tapestry is a slow process, Many long hours go into the production of one piece. 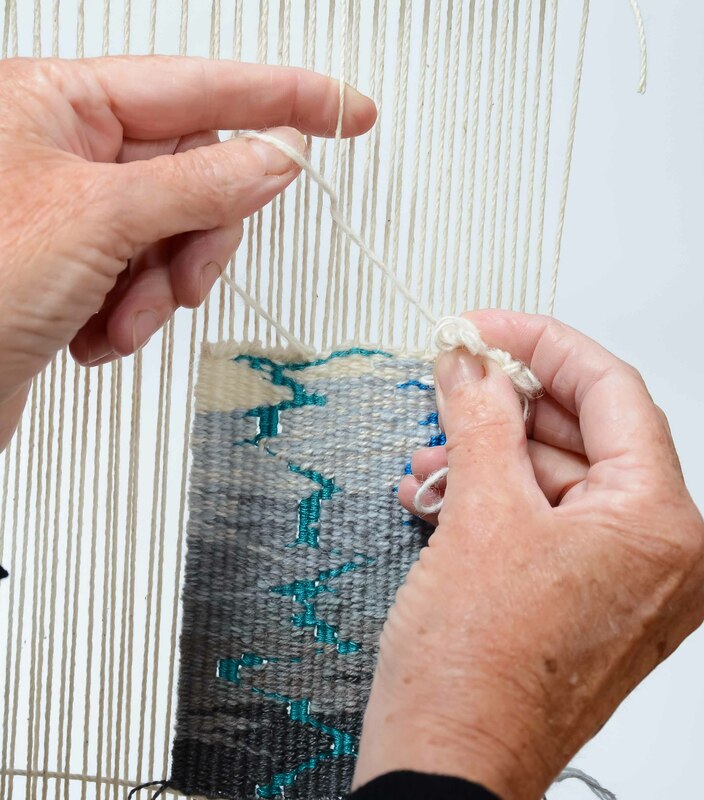 Frances will conduct a workshop on Saturday August 2nd where the learners will put on a warp, build the floor of the weaving, Weave plain, diagonal, pattern, image making and texture. The students may borrow equipment and materials on the day or purchase. From 1.30-2.30pm on August the 2nd Frances will give a demonstration on her process. To book please go to http://www.boylearts.com or email Frances on francrowe@eircom.net. Download the poster: THREADING WATER poster.